The PTU kit I am using is called Kiss of Valentine by Rebellious Scraps. Use my tag as a reference as to where to place elements. C/P sofa & resize 60%. C/P valentine pinup & resize 60%. C/P love potion 1 & resize 20%. C/P frame 2 & resize 30%. 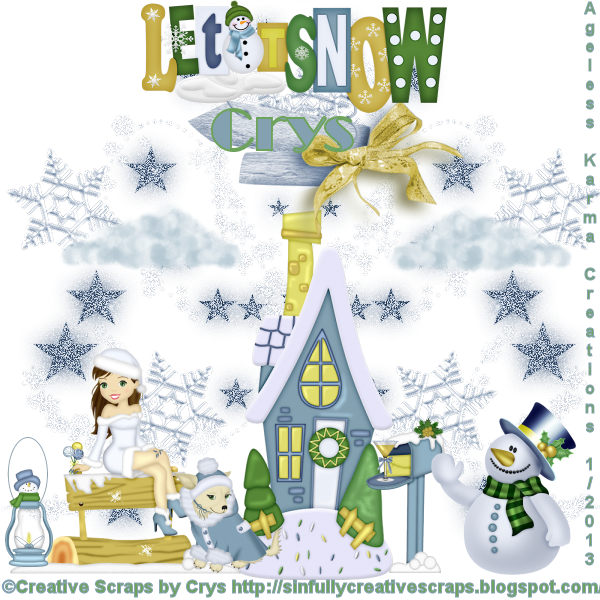 C/P gift box 2 & resize 20%. C/P cupid 1, Mirror & resize 30%. C/P heart bag 1 & resize 30%. C/P mailbox & resize 25%. C/P xoxo chain 1 & resize 25%. C/P ringbox & resize 10%. C/P chocolate box & resize 15%. At this time you can add your Copyright & Watermark. I used Arial for the Font. I would love to see your results of this tutorial, please send them to agelesskarmacreations@yahoo.com. The awesome artwork I am using is called Cheer by Keith Garvey. The PTU kit I am using is called SKDS Grid Iron by Scrappin Krazy Designs. C/P ele59 & resize 40%. C/P ele03 & resize 40%. C/P ele08 & resize 50%. C/P ele01 & resize 40%. C/P ele02 & resize 20%. C/P ele54 & resize 50%. C/P ele04 & resize 60%. C/P ele06 & resize 40%. C/P ele05 & resize 40%. C/P ele14 & resize 40%. I'd love to see your results of my tutorial, please send them to agelesskarmacreations@yahoo.com. In this tutorial, I will be using Scrappin Krazy Deigns PTU kit called SKDS Rock N Roll. You can get it at Tagging Angels Store. I am using the artwork of Arthur Crowe. The name of the tube is Beauty Legs. Make sure you have a license to use his work. I will use C/P for Copy/Paste & please use my tag as a reference as to where to place elements. Also, add drop shadows to the elements as your like. Using your Magic Wand, click inside the filmstrips & C/P your tube to your liking. C/P discoball & resize 30%. Duplicate & mirror that layer. I am using the amazing art work of Keith Garvey. This tube is called Robin. You can purchase the tube & a license to use his work at the link to his tube website. The FTU kit I am using is called Heartbreaker by Justine of Creative Misfits Creations. Click the link for Justine's name to download. I am also using Vix's Vix_Mask_Valentine1 mask. You can get it by clicking the link. I will use C/P for Copy/Paste. Please use my tag as a guide as to where to place elements. Select your mask from the drop down menu & click ok. Here, I closed off my background layer & merged what was visible. Then I opened my back ground layer again. Here I closed my merged layer. Next, using your Magic Wand, click inside the frame. Next, open your tube. Here, I used the closeup, but I mirrored her first. Copy your tube & paste into frame. Position to your liking. Open your merged layer again. C/P flair & resize 50%. C/P note & resize 25%. C/P WordArt2 & resize 60%. C/P flower. Duplicate & resize 25%. C/P Stapled Heart & resize 30%. C/P Sticker & resize 40%. C/P Fuzzy2 & resize 40%. C/P String Flower2 & resize 30%. I am using the beautiful Jersey Princess PTU kit by Black Widow Creationz. The tube I am using is by Gary Rudisill called Jersey Princess. You can get BOTH exclusively at SATC. The mask I am using is Vix_Mask02 by Vix. Now you can add the mask. From the drop down menu choose Vix_Mask02 & click OK.
C/P BWC_JerseyPrincess_EL6 & resize 70%. C/P the Jersey Princess tube & resize 50%. C/P BWC_JerseyPrincess_EL18 & resize 25%. Make a duplicate of your Jersey Princess tube & close the original. C/P the Jersey Princess tube & resize to 40%. C/P BWC_JerseyPrincess_EL13 & resize 35%. C/P BWC_JerseyPrincess_EL4 & resize 30%. C/P BWC_JerseyPrincess_EL5 & resize 35%. C/P BWC_JerseyPrincess_EL26 & resize 35%. C/P BWC_JerseyPrincess_EL20 & resize 25%. C/P BWC_JerseyPrincess_EL3 & resize 40%. C/P BWC_JerseyPrincess_EL35 & resize 30% & Free Rotate 45 Degrees..
C/P BWC_JerseyPrincess_EL34 & resize 30% & Free Rotate 45 Degrees. C/P BWC_JerseyPrincess_EL32 & resize 30%. C/P BWC_JerseyPrincess_EL33 & resize 50%. 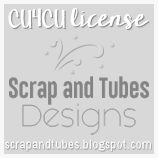 Font for the Copyright, I used the layer that came with the tube. Add a drop shadow to your Tag Name Layer. The PTU kit I am using is called Cheers by Manipulated By Magik. You can purchase Cheers at the Tagging Angels store website. The Mask I am using is Vix_Mask208 by Vix. You can view the collection by clicking the links. Don't forget to leave some love when you download. Please use my tutorial as a reference as to where to place elements. Using your Magic Wand, add the mask. Choose your mask from the drop down menu & click OK.
C/P balloons & resize 40%. Duplicate twice & place behind next element, to your liking. C/P cityscape & resize 80%. C/P lips & resize 30%. C/P convertible & resize 50%. C/P brad & resize 50%. 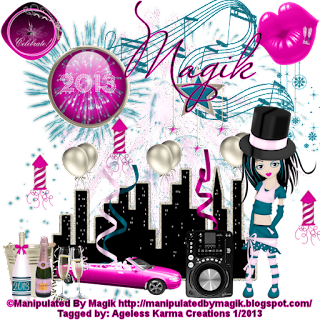 C/P partygirl & resize 60%. C/P clock & resize 30%. C/P deco 1 & resize 40%. C/P bucket & resize 30%. C/P champagne & resize 30%. C/P champagne 2 & resize 40%. C/P champagne flutes & resize 30%. C/P rocket & resize 30%, then duplicate twice. Place duplicates to your liking. C/P star dangle & resize 40%. C/P streamer & resize 60%. C/P streamers & resize 50%. C/P stereo & resize 30%. C/P music notes & resize 30%.